Fiction University: To Join or Not to Join a Professional Writers Organization: That is the Question. To Join or Not to Join a Professional Writers Organization: That is the Question. JH: Deciding to join a professional writers’ organization isn’t always an easy choice. Anne Armistead takes to the podium today to share thoughts on making that decision. Anne Armistead earned her English degree from the University of Georgia and her MFA in Creative Writing from Spalding University. She is a member of the Romance Writers of America (RWA) and the Georgia Writers of Romance (GRW), along with the National and Georgia Sisters in Crime (SinC) organization and the Society of Children’s Book Writers and Illustrators (SCBWI). She writes historical fiction children’s stories for Highlights Magazine under Sandra Havriluk. 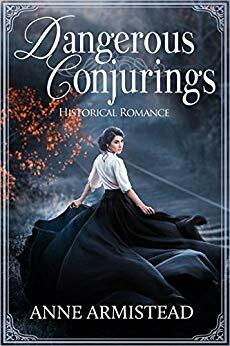 Dangerous Conjurings is her debut historical romance. Under the title Treacherous Hearts, it was the winner of the 2014 YA Fab 5 Wisconsin Romance Contest. Sandra has placed as a finalist the GRW’s Maggies contest, as well as in the RWA Daphne Contest and the YARWA Rosemary contest. Sandra has presented on panels at the 2018 Milton Literary Festival and will present at the October 2019 GRW conference Moonlight and Magnolia on the topic “Turning a Nugget of History into a Novel.” Her latest historical romance With Kisses from Cécile will be released early summer 2019. Have you thought about joining a professional writing organization but wondered if the time, effort, and cost would be worth it? While there are cons to belonging to a writing organization, have a sip of coffee and read on to decide if the pros outweigh them for you. First, let’s address some drawbacks. There are initial and yearly dues to pay, an account and profile to set up and maintain, volunteer expectations, and even more emails in your inbox. To join a local chapter of a particular organization most times requires you to join the national one as well. Many organizations have monthly meetings, which means another commitment on your calendar. And, while many organizations do have yearly conferences with great keynote speakers and networking opportunities to meet other authors, pitch your work to an agent or publisher, and even present workshops yourself, attending brings even more financial and time commitments. After reading the above “cons,” what, you may ask, could possibly be the “pros” of belonging to a professional writing organization? Here’s a top-ten list for your consideration. Many organizations offer online webinars and training sessions at free or reduced cost. Some provide opportunities for you to submit your writing for critique. Others run contests which provide feedback and perhaps even monetary awards if you final or win. Many organizations offer the opportunity to apply for grants and/or scholarships. Some offer writing residencies during which you focus on your work-in-progress with living expenses subsidized. Many organizations’ websites provide resources; updates on industry trends and on agencies and editors seeking queries and submissions; and advice on legal and accounting requirements. Belonging to a professional writing organization provides you with a built-in mentoring group, as well as experienced writers who can guide you through the maze of honing your pitches, queries, submissions and understanding the financial and legal parts of a writing career. It also gives seasoned authors the opportunity to give back by mentoring “newbies.” Remember, the mentor learns as much from the mentee as the other way around! Relating to #8, above, you can seek out legal help and perhaps even representation regarding legal issues you may face throughout your career. Having the weight of a professional organization behind allows you to better fight legal battles such as contract disputes, rights, harassment, libel, plagiarism—even stalking. If through your writing you advocate for a certain social cause/belief, joining a professional organization that coalesces with your concern provides you with a platform to deepen and advance your cause and get your writing in front of readers supporting it. It’s a win-win. It goes without saying that organizations cannot exist without leaders to lead them. By serving on a professional organization’s leadership board, you can shape a legacy in the writing community and foster writing careers. Being a leader gives you gravitas when accessing top writers, agents, editors, and other writing professionals when organizing conferences and meetings. Also, some organizations provide leaders with financial assistance to represent their local chapter at national conferences. Most professional organizations’ leadership is all volunteer-based, but in addition to serving as a volunteer board member, organizations offer many other volunteering opportunities. You can mentor, help run a conference, present a workshop in an area of your expertise, write an article for the organization’s publications, offer networking assistance—no volunteer job is too small! Volunteering serves as a viable way to feel a part of the larger writing community, not to mention enhances your feeling of good will toward professional peers. 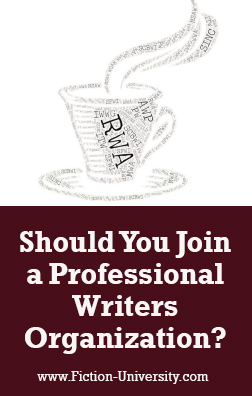 Membership in professional writing organizations provide valuable networking opportunities. You get to know your colleagues, find critique partners, discuss trends, meet top professionals in the industry—just to name a few networking benefits. Being an author is a solitary existence for most. Attending professional organization meetings is a nice social outing with kindred spirits. For an emerging writer as well as for an established one, being a part of a writing organization provides you with respected credentials to deepen your resume and reputation in the writing community. Research your favorite and most successful authors, and you will find many are or have been active in professional organizations. To share the same organizational membership would be a mark of prestige. To be or not to be a member of a professional writing organization all boils down to your own career goals, priorities, and needs. Sure, reasons 2-10 are all viable, but you must “know thyself” before jumping into the organization membership pool! Most organizations that meet in person will allow non-members to visit a meeting. Many conferences are open to non-members. Try out the organization and evaluate how you see yourself as a part of it. How to find the right organization for you? 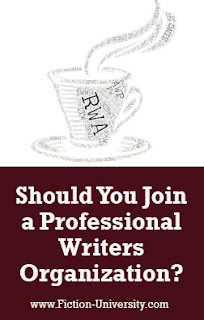 A list of professional writer organizations is included in the Writer's Market 2019: The Most Trusted Guide to Getting Published by Robert Lee Brewer, Editor. Here are other links to find organizations to evaluate. Warning: Beware of the ones that are out to “scam” you, existing only to draw you in to purchase their materials. Do your research! Word of advice: being an involved member results in the best experience. Assess the time you have to give an organization as well as what you hope to get from it. Membership is to enhance your writing life, not take it over! Choose your organization carefully and avoid over-committing to so many organizations that you can’t take full advantage of all they offer. After reading the above and thinking about your own writing goals, priorities, and needs, if you decide to forego joining a professional writing organization, you should access its website. Many offer valuable resources free to non-members.